Have some local news? You can e-mail us too! This year's winner of the Cottage Grove High School Lion's King Award! Enjoy riding the Row River Trail? Need an opportunity to bike this family-friendly path just 30 minutes SE of Eugene? We are thrilled to be hosting this partnership event that will provide participants with an in-depth understanding of the rare plants, natural history, and habitats of the Dorena Lake area of the Row River watershed. Featuring botanists Cheshire Mayrsohn and Wes Messinger who are leading restoration on federal lands in the area. THERE ARE A FEW SPOTS LEFT, REGISTER TODAY! This bike-based wildflower tour will run from 9am-2pm at three sites on the Row River Trail along scenic Dorena Lake. Regional plant experts will lead participants through natural areas with native prairie plants in bloom. Participants should bring a helmet, water, a picnic lunch, and their bike in order to ride the approximate 5 miles between the three sites. All sites will be accessible by car, but riding is encouraged. Pre-registration is required and space is limited. See the events page for more information. We are thrilled to be hosting Pacific lamprey researchers Gabe Sheoships and Luke Shultz from Oregon State University! They will speak to both the Native American and research perspectives of the Pacific Lamprey, an iconic eel-like fish that is native to the Willamette River. A showing of Freshwaters Illustrated's new film 'The Lost Fish' will follow--join us for FABULOUS evening of watershed science! 7-8pm Movie Lost Fish: The Struggle to Save the Pacific Lamprey will be shown at the ARCADE THEATER. Located at 513 E. Main, two blocks west of Axe & Fiddle in historic downtown Cottage Grove. The Coast Fork Willamette Watershed Council invites you to join us for an informal and fun regular monthly gathering. Our Science Pubs just keep getting better! Come early for games and prizes! 10% of food and beverage sales all evening will be donated to the Coast Fork Willamette Watershed Council (when you notify your server). Thank you to our business sponsor! Chats, anyone? The wooded hillside behind Cottage Grove High School is known as Yellow-Breasted Chat habitat. We will meet at the R Street parking lot behind the high school at 8:00am for a short walk, then proceed to Row River Nature Park by 9:00am for continued birding. This will be the premier month to find mating and nesting species during a hopefully sunny spring outing. You can start the morning at either location. Parking at Row River Nature Park is near the BMX track, across from the Masonic Center at 3300 Row River Road. On-River Volunteer Opportunities in May! Would you like to join other boaters in improving our local rivers? Our annual clean up float is being planned and we are recruiting volunteers to assist with temperature monitoring and invasive species mapping. The Water Ouzel Float is planned for May 24th 9am--RSVP today for this and other days you are available to hit the river with us! Contact Reilly Newman, Education/Outreach Coordinator to get the details and to sign up at (541)767-9717! 2012 Main Street Chili Cook-Off! Travis' Village Green Resort's "Three-Bean Prime Rib Chili" took the honors at this year's "Main Street Chili Cook-Off" in Cottage Grove, Oregon. The Village Green Resort has won awards in this competition the last three years in-a-row. Well, you've got to admit, Verizon Wireless definately has the most reliable and widest coverage of cell phone and Internet connection devices in the Cottage Grove area. But with the new Verizon store in town, selling the heck out of the 4G / 3G Mi-Fi wirelss internet modem and other cell phone mobile devices, we have heard numerous complaints from local customers and users that the data connection is very slow to non-existant at certain times of the day. Verizon is selling the 4G modems at the local store owned by The Cellular Connection and there is not even 4G coverage in the area yet! Our Verizon tower is rumored to have a microwave connection to the tower in Creswell (versus having its own fiber optic connection - or similar direct connection) to the tower. Yes, that means that all the residents of Cottage Grove are relying on one Verizon cell tower that is also shared with the residents of Creswell! We are receiving numerous complaints that Verizon needs to upgrade its tower or add another tower to our area. WE COTTAGE GROVE RESIDENTS NEED YOU HELP! SUPPORT DEPARTMENT AND LET THEM KNOW! Verizon support department is one of the best and they will treat you politely, but you need to make the call to file a Trouble Ticket and let them know how frustrating it is to pay a premium price for cell phone service that is not working as they advertise it should. There is 4G coverage in Eugene and all the way down I-5 to Goshen. Please call and let them know we want better coverage and a 4G tower for all the loyal Verizon customers of Cottage Grove! 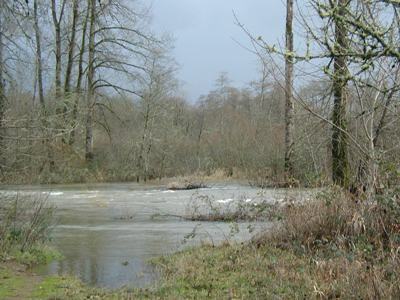 On March 12, 2012, The Oregon Department of Fish & Wildlife redirected 212,127 McKenzie Hatchery smolts into the Coast Fork Willamette River and its tributaries. This effort delivered fish to six different locations--three on the Coast Fork Willamette, one on the Row River, and two in Mosby Creek. These fish (ranging about 4-8" in length) will likely migrate downstream very soon, but there is a decent probability that when these hatchery fish return to the Upper Willamette (either as Jacks in Years 1-2, or as spawning adults in Years 3-4), that they will attempt to return to the Coast Fork. Since the purpose of rearing them at the hatchery was to support a fishery, Coast Fork residents will likely see more fishermen out in the river trying to catch these fish. Like all Upper Willamette salmon, the fish also have to avoid being caught at the mouth of the Columbia or at Willamette Falls by sportfishermen. But if they are NOT caught, and if they find suitable habitat to hold in and then spawn in (like our newly restored spawning grounds in Mosby Creek), and if conditions support the proper development of the eggs into fry, and if these fry turn into smolts who do it all again, then we could have the beginnings of a self-supporting spring Chinook run in the Coast Fork. Obviously, this is a lot of "IFs" to get to an actual run of spring Chinook, and if your interest is not fishing, then it is important to adjust your expectations about the purpose of these fish. However, this is the first time that spring Chinook smolts have been introduced into the Coast Fork in over 30 years! With this 'fishery' comes the nutrients, protein, and genetics that have long been absent from this ecosystem and with it comes a glimmer of hope which inspires us to restore all the components of aquatic ecosystem! If this inspires you, I hope you will join us in working for the fish by coming to one of our events or by donating to support our work! And GO CHINOOK! Join us for Lynx Hollow Work Parties! Spend your Saturday morning outside with us helping to protect habitats in the historic floodplain of the Coast Fork Willamette River with State Park Ranger Scott Youngblood. Help remove English ivy trying to strangle the trees in this park! We'll also look for stands of native plants like nettle to protect from reed canary grass and do a bit of wildcrafting. Bring boots, water, and your favorite ivy tools--we'll provide the snacks. For questions about the event, please call 541-517-8580 or 541-767-9717. Reply to our event on Facebook! Come out for a morning of hands-on and educational Earth Day activities in the historic floodplain of the Coast Fork Willamette River with State Park Ranger Scott Youngblood, Coast Fork Watershed staff, and volunteers! Learn about Western pond turtles and help place a basking log in the ponds! See our progress on English ivy & continue the battle! Bring clean cardboard (no tape or staples) to help smother other invasives like Vinca major at this site. Bring boots, water, and your favorite ivy tools--we'll provide the snacks. For an interesting and detailed view of the watershed maps and possible restoration projects, please stop by the Council office. The second annual Friends of Mosby Creek Picnic took place on Sunday, September 14th, 2011 at Blue Mountain Park, with support of the Coast Fork Willamette Watershed Council. Mosby Creek is the focus of a broad collaboration between these local groups, ODFW, BLM, and Weyerhaeuser to improve habitat for spring Chinook, cutthroat trout, and Western pond turtles. Volunteers created a display and interpretive signage of the native flora just for this event. The rustic site had floodplain and riparian characteristics that the council seeks to enhance in future projects with local landowners. Site visits are beginning this winter! Please call the office at 767-9717 to schedule one today. U.S. Corps of Engineers Willamette Watershed Restoration Maps are available for viewing in the Coast Fork office. THE OLYMPIC TRIALS WITH THE GOLD RUSH 5k RUN! Teagan Settlemeyer leads the pack on the start of the 5k. North Carolina's Chris Squires & CG's Patricia Guiterrez round the corner. Cottage Grove High School 2008 Hall-of-Famer and Olympian track star (4-min miler!) Dyrol Burreslson & CG's "Scoggins" enjoy the race. 1st place Michael Bennit congratulates grandfather David Elliot 13th. Cottage Grove High School track star, Patricia Guiterrez, finishes strong with a 12th overall. CG Walkers "cruised" their way through the 5k! CG's Dan Bousted with a smiling finish. The Tolberts from Maryland, enjoyed the race. Wal-Mart's Public Hearing at the Cottage Grove City Hall in front of hundreds of onlookers was rowdy and controversial to say the least. The meeting which was supposed to last from 7:30-10:30PM was nearly filibustered by an overwhelming testimony of Wal-Mart attorneys who turned the "public hearing" into an overwhelming display of slide shows, projected land use changes and traffic -studies that gave the public little-to-no-right to speak in opposition. Wa[lMart's pitch for the Superstore is mainly to sell groceries (while expanding its operation to over 150,000 square feet - not to mention the outdoor "uncovered" grounds which are not included in the square foot expansion estimates). They said, "it will bring competition to Cottage Grove." A Wal-Mart Superstore does not just sell groceries, but many, many other items that compete with a majority of local businesses trying to stay alive in our unique community. In Circleville, Ohio, population 13,000, the local RCA television-manufacturing plant was once a source of good jobs with good pay and benefits. But in late 2003, RCA's owner, Thomson Consumer Electronics, lost a sizeable portion of its production orders and six months later shut the plant down, throwing 1,000 people out of work. A town like Cottage Grove is filled with locally-owned businesses that cannot compete with the world's largest retailer, Wal-Mart, who imports the majority of its items from China and other overseas companies with great buying power that any local business cannot compete with. We urge you to support your local Cottage Grove businesses by attending the next Public Hearing to be held in approximately two weeks. public comment on Wal-Mart's proposal. Where: City Hall Council Chamber, 400 Main St.
One of Cottage Grove's residents has recently made a short documentary on the problems local LTD riders are facing with limited scheduling and bus capacity. It is an interesting story with some great viewpoints of what the current LTD scheduling issues are and what sorts of different inconveniences it is causing the users. You can watch the movie by clicking here. We have also added a new Bulletin Board category called the "LTD RIDERS' FORUM" specifically for the LTD riders and community to post their comments and concerns on. Any participation is certainly appreciated! The new (OSRM) Oregon State Railroad Museum scheduled to open in 2005 (the new owners of the Perrydale Depot), is currently considering at 2 former Lane County area logging railroad right of ways, on one they hope to open the excursion part of the new museum. Both right of ways are owned by Weyerhaeuser, with one going from Springfield to Marcola; and the other Going West, out of Cottage Grove. Weyerhaeuser has not disclosed the location of that right of way; but at a meeting this week (July 12-19), Weyerhaeuser reps will fill in the details for us. We believe though, that the line they are suggesting, is the old Chambers Mill Logging Rail Line; and if it is, the old covered railroad bridge, will once again handle trains across/through it. Once open, the Museum and it's tourist excursions (steam trains, diesel and electric trolleys) will attract literally 10's of thousands of tourists per year; and whichever city's line the museum selects, that city will witness an economic boom. This means that a lot of jobs will become available in CG; at both the museum / railroad; and in throughout the city. OSRM has a web site at http://osrm.org While it is not complete yet, it will give you a lot of information and a good of what we have planned for the museum. If you like what you read about us, there are email icons, you can click on, to volunteer, ask questions, and a Paypal contribute icon with which you can use to contribute (donate). If we find that it is the line with the bridge, that will become a major decision factor; when working out the final details with Weyerhaeuser. We will also need volunteers to help us move the depot to the museum's new site. The big deal is that we are growing! Not taller, but in numbers. Cottage Grove's new census report says we went from 8,912 to 9,010 residents...that's a whopping 98 residents! Well, a little more traffic will never hurt anyone! Cottage Grove was again named "All American City" Saturday by the National Civic League in Atlanta, GA. This is second time that Cottage Grove has been recognized, and is now one of only two Oregon cities to be awarded this recognition twice (Salem received the award in 1960 and 1982).This will undoubtedly make Cottage Grove an even more desirable place to live and help to develop additional recognition, economic development and tourism. NEW HIGH SCHOOL IS OPEN! Cottage Grove's beautiful new High School is open for business. Sunday September 7th was the official grand opening date. The new school is a proud addition to the community! Peace Health / Cottage Grove's new hospital is open and in business! Cottage Grove's new hospital will handle all physician and Level 1 trauma patients for the surrounding areas.